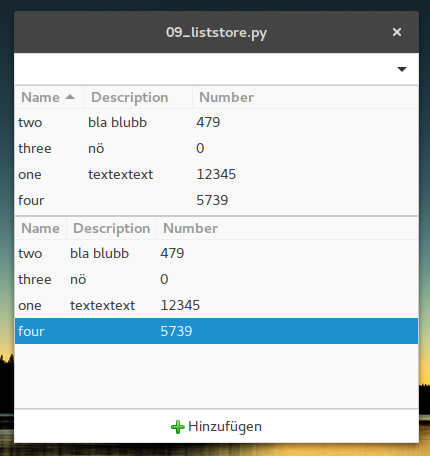 In the example there is one ListStore created via "Miscellaneous > List Store" which will be later used by three Widgets. First there are some rows created. ListStore data sets can be inserted in Glade but this in practise is only convenient for typing in few data sets. Content changes in the ListStore are simultaneously updated in the Widgets using the ListStore. 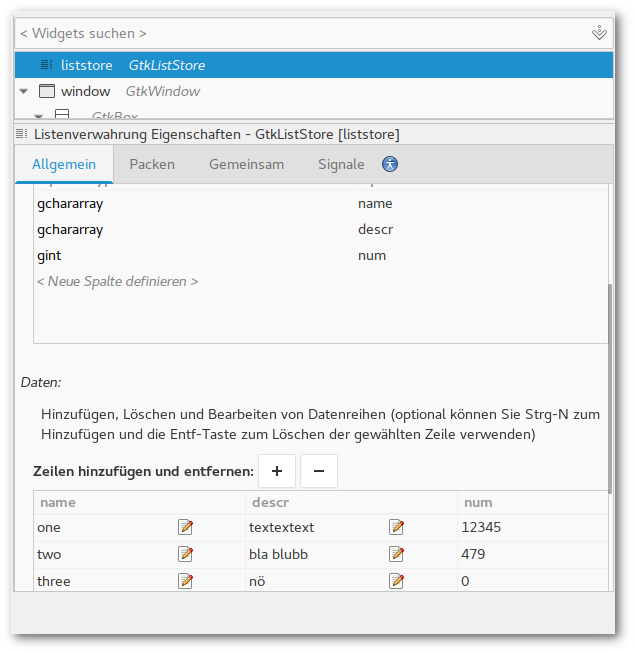 For individual sorting of the same List/TreeStore it is needed to create Gtk.TreeModelSort elements (this element is used in the example of the TreeStore article). Creating the widget you are prompted to choose as "TreeView Model". In the edit mode accessible via "Edit > Hierarchy" there is created a CellRendererText. In the first field ("Text") the column to load the items of the dropdown menu from is set. To process the selection you will need the changed signal. The first TreeView widget is placed within a Gtk.ScrolledWindow container. Like in a ComboBox there are created CellRenderers representing a column to show in the TreeView table. If the sort indicator is activated columns can be sorted on a column table click. Columns do not have to be sorted according to the columns they show. The second TreeView widget is created within a Gtk.ViewPort. This container widget does not provide scroll bars but the automatically adapts the necessary size to display the whole content. So for larger tables you will need the Gtk.ScrolledWindow. The sort indicator is deactivated and the middle column ("Description") is made editible with the signal "edited" allocated. The button's function is appending a row to the ListStore, so the clicked signal is required. The ListStore's row can be iterated over via for row in store. New rows are added by append, other options are insert or remove to add or delete rows at specific positions. For accessing a data row you need a Gtk.TreeIter object which points to the position in the model (this can also be achieved by a Gtk.TreePath object). The edited signal passes the position and content of the edited cell. The new content of the CellRendererText has to explicitly be committed to the data store otherwise the content will return to the pre edit state. This can be accomplished by using the passed TreePath position.